The lineup tonight (especially 9 PM) is truly awesome (see below), and quite disturbing if your DVR is out of whack (like mine). * There are an awful lot of shows tonight, but the question is whether it is a big night?, an awesome night? an awful night? or whether the various channels are simply competing each other to death by fragmenting the audience? True, the stations are hedging their bets (most of them) by scheduling re-showings of the films later and later and on other days, and on their other channels. And many homes now have separate screens for each member of the house, and some people even monitor more than one screen. And most people (not me, tonight) can time-shift some shows with the help of their DVR. But I still don't know if putting everything together on Sunday is such a big idea. ** The "small" screen is an increasingly inaccurate description of what is (in this context) broadband/cable TV. The "small screen" is not always small >> sometimes it is now a 54" or bigger 3D behemoth, and sometimes it's tiny (watching the show wi-fi'd to a smartphone). And "TV" is not the only thing to watch there either, since the internet is often channeled to the TV monitor. Alas! In this episode, SHAMELESS (JAN 22, 2012), has taken a turn away from amusingly shameless, toward unpleasantly evil. Episode #15 Season 2 #3 "I'll Light a Candle for You Every Day"
Most of the sketches were funny, but only one or two were memorable. Emma Stone was not terribly visible (she had minor supporting roles in most skits). Actually, nothing seemed as visible as the commercials which seemed to take up more time than the sketches. As is often the case, the wildest sketch was the last. COLD OPEN -- The GOP Debate -- It was really like a trip back in time to see how the Republican field has changed. (This show originally aired in November 2011.) Here we had Perry crashing over his OOPS moment. Later, Weekend Update commented on the irony that one of the two departments Perry remembered he wanted to eliminate was... Education. Romney was as boring then as he is now. Monologue -- Pretty lame. An amusing Spider-Man did come down from the sky upside down, and the movie Spider-Man showed up. (Emma will be in the next Spider-Man movie). Secret Word -- It's the same joke we've seen a bunch a times. Seemed a little funnier than usual. Maybe just because they had the balls to do the same joke again. And again. And again. WXPD News -- This is also a sketch concept we've seen before. The joke is that the aged street journalist keeps hitting people in the face with his mic, and does other unprofessional things that a decrepit, over-the-hill newsman might do. Same jokes. Still sort-of funny. Digital Short -- ??? WTF ??? Coldplay -- They looked good on the set, and sounded good. Weekend Update -- Except for the joke mentioned earlier, the jokes were kind of lame, as was the musical duo (another repeated sketch concept -- and, like the other repeats, it was based on incompetence-humor.) The Devil brought some wicked satire to the Penn State scandal. Les Jeunes de Paris -- The best sketch of the night. It managed the trifecta/hat-trick! It was comedy; it was a story; and it was a dance. The comedy was actually funny. The story was clear. And it was all done with a good-looking/funny/story-dance. Bridal Party -- This was possibly a concept that had promise -- one guest who seems the least cool provides the hottest gifts -- but the execution was just not quite right (partly because the actual skit was: the "nerdy" guest gave "crude" gifts). Crying / Adele -- The perfect expression of an attitude. We're Going To Make Technology Hump -- And they did! Nice way to end the show! LOST GIRL is an appealing succubus story. The characters are very attractive, and the action is interesting and even a bit surprising, perhaps -- with a little SPARTACUS type gladiator-style action in the middle of the premiere. This seems to be an import by the SYFY channel of a show that is in its second succesful season in Canada. This was a middle-of-the-road average show with one great sketch. The performances were fine. Radcliffe is a real pro, though he's best in character comedy (where he plays a character who is funny, rather than telling jokes, or being wild). Lana Del Rey, who stirred some controversy for being a bit green -- her first album is not quite out yet -- was not much worse or better in performance than most musical artists. I find the SNL mix a fairly unflattering pulpit for most artists, even really famous ones. Cold Open -- A rather confused Mitt Romney. Not a great impersonation. Poorly written. Some of the usual Romney jokes. Monologue -- Pleasant enough, but it seemed lacking in inspiration. Ricky Gervais -- was funny, but the real Ricky Gervais is funnier (though the impersonation was so good, maybe it was the real Ricky Gervais). This was also a not-so-subtle plug for the Golden Globes tomorrow (Sunday 1/15) on NBC. Target -- The crazy clerk. Nothing that hasn't been done before. More strange than funny. You Can Do Anything -- This was an homage to SNL's favorite source of comedy: incompetence. The character's anthem: "I tried and therefore no one can criticize me." Spin the Bottle -- Radcliffe was game for a bit of gross-out humor. Delaware Fellas -- Another sketch based on incompetence humor; but they've got the plot of musical-group movies down pat. Hogwart's 2020 -- The inevitable Potter sketch. The renditions of Potter characters years down the road was spot-on! But not much else in the sketch was funny. Weekend Update -- The jokes were just OK. The North Koreans were just OK. Casey Anthony's dog was a star. Glenda Okones -- A candidate provides attack ads against herself. Not that well done, but each new Okones ad in between other commercials improves the concept a bit. Jay Pharoah Show -- A combination of the two leading types of SNL humor: incompetence and impressions. Pharoah is one of my favorite newcomers, but this sketch is just the usual incompetent interview when the interviewer knows nothing about the interviewee -- in this case Daniel Radcliffe as himself -- and just does impressions. Headz Up -- Second best sketch of the night: An App that tells you what's happening in front of you. (Driving, and texting, the App tells you when to turn, crossing the street and texting, it tells you when you are about to get hit by a car, etc..) Alas, too many people could really use this product if it worked. Not a bad SNL, but not a really good one either. Three good sketches: the Dog, the App, and the Pollster. with matinees Sundays at 3:00pm through January 29. 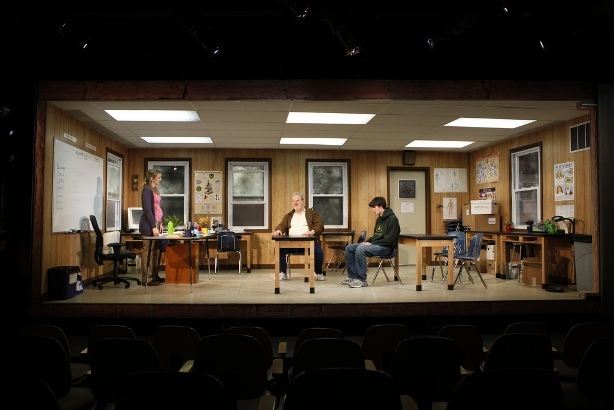 HOW THE WORLD BEGAN is a simple play about moderately simple people and fairly complex issues. Specifically, it is about small-town (Kansas) attitudes toward religion and big-city attitudes about science. That's attitudes, because the play is about attitudes not substance. A teacher, not that well prepared for the job, several months pregnant and sans guy, comes -- from the big-city to a Kansas town devastated by a tornado -- to teach biology. The play begins when a student confronts the teacher over her use (before the play begins) of the term BOBBLEDYGOOK, apparently to describe Biblical views of (spontaneous -- God-given) creation. The play is worth seeing for its attempt at portraying ordinary people in a situation that is getting out of hand, and for the performance of Justin Kruger. Although he is too big, too hunky, and many years too old to play a high school biology student; he is a big, hunky, strong actor in his New York debut, who captures convincingly the manifold aspects of his character's character, and he could have a nice career ahead of him. The set design is interesting. Suggesting a schoolroom reconstructed after the old school was destroyed, a complete biology classroom is constructed on top of a set of cinder blocks. The light for the room comes from what appear to be skylight windows on the top of the schoolroom (with the theatrical lights out of sight). The play gets off to a somewhat rocky start, because the first scene seems stagey and unnatural. Aside from the fact that the boy seems too old to be in the class, the whole scene does not feel like any encounter that could happen in the real world of a high school. There is something unreal and vague about the whole situation of the play -- it doesn't seem grounded: Does the teacher teach anything else? Why would she be hired to teach only biology? What part of the school year is this? The first class? What level is the class? A first class in science for seniors? How much preparation did the teacher have before she came to teach? Where are all the other teachers? the other classrooms? The teacher (Heidi Schreck) is presented -- most likely with a deliberate intention -- as confused, unprepared, with personal baggage, and without "poetry" in her language. Adam LeFevre, as the boy's guardian, plays the role of "mediator" with straightforward reasonableness. There is something admirable and important about trying to create "minimal" "normal" characters. I did not find, however, very much in the character of the teacher -- as it evolved over the course of the play -- that was very different, or more interesting, than the single sentence description above. This play, of course, evokes memories of Oleanna -- student vs teacher -- and Inherit The Wind -- evolution vs. religion. This is a much more casual play than either of those. I was most concerned, however, by the fact that the only objective of the teacher seems to be to keep her job. She does not ever confront (though they are briefly mentioned) the deeper issues of science and religion. Also, it is disappointing that any serious dealing with the religious views of the boy are undercut by revealing that he is very, very disturbed. His religious "convictions" are trumped by his profoundly troubled soul. The final scene is most interesting. When the student reveals both tender feelings for the teacher, and how profoundly mentally shaken he is, suffering something like a seizure -- recalling the first scene -- the teacher comes to comfort him in a way that is almost inappropriate. But when he politely reacts to her joy that her baby is moving, she shuts him down immediately. Were this the beginning of the play, it would suggest a very promising dynamic, but at the very end, it just seems like an arbitrary piece of scripting to put a finish on the play. Perhaps -- I mean this seriously -- the play is most interesting for how it dodges the serious issues and real questions that are raised in the first scene: teacher/student science/religion. For in the real world, most of the time, the truth is, these issues are dodged, not confronted, and never solved.